Abstract: The α2-adrenergic receptor agonist guanfacine, in its extended-release formulation (GXR), is the most recent nonstimulant medication approved in several countries for the treatment of attention-deficit hyperactivity disorder (ADHD) as monotherapy and as adjunctive pharmacotherapy to stimulants in children and adolescents. The present paper aims to review comprehensively and critically the pharmacodynamic and pharmacokinetic characteristics and the published evidence on the efficacy and safety profile of GXR in the treatment of ADHD. A comprehensive search of relevant databases (PubMed, Embase, and PsycInfo) was conducted to identify studies published in peer-reviewed journals until January 15, 2015. Though the precise mechanism of action of guanfacine in the treatment of ADHD is not fully understood, it is thought to act directly by enhancing noradrenaline functioning via α2A-adrenoceptors in the prefrontal cortex. Weight-adjusted doses should be used, with a dosing regime on a milligram per kilogram basis, starting at doses in the range 0.05–0.08 mg/kg/day, up to 0.12 mg/kg/day. As evidenced in short-term randomized controlled trials and in long-term open-label extension studies, GXR has been shown to be effective as monotherapy in the treatment of ADHD. Furthermore, GXR has also been found to be effective as adjunctive therapy to stimulant medications in patients with suboptimal responses to stimulants. 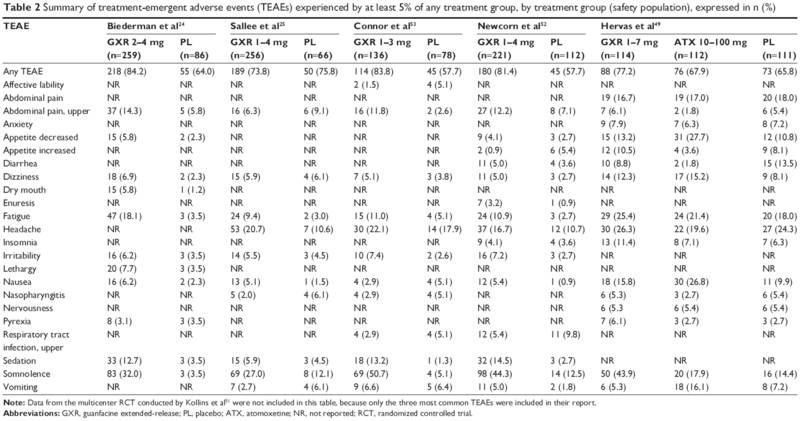 Many of the adverse reactions associated with GXR, particularly sedation-related effects, were dose-related, transient, mild to moderate in severity, and did not interfere with attention or overall efficacy. There are no reports of serious cardiovascular adverse events associated with GXR alone or in combination with psychostimulants. Since the publication in 1937 of a study showing the therapeutic effects of Benzedrine, the racemic mixture of levo- and dextroamphetamine for hyperactive, inattentive children,15 stimulants, including amphetamine (AMP) derivatives and methylphenidate (MPH) formulations, have been widely use and remain first-line pharmacotherapies for individuals with ADHD, due to their evidence-based efficacy.9,16–18 However, a proportion of patients do not tolerate or fail to respond adequately to stimulants.19,20 In addition, some patients or their caregivers prefer not to take stimulant medications, and in some cases there are contraindications to MPH- or AMP-based treatments, including symptomatic cardiovascular disease, glaucoma, or some severe or unstable comorbid psychiatric disorders, as well as concerns about drug diversion.9,21,22 Consequently, other safe and effective pharmacotherapies have emerged for treating patients with ADHD. Atomoxetine (ATX; Strattera®; Eli Lilly and Company, Indianapolis, IN, USA),23 a selective noradrenaline-reuptake inhibitor, was the first nonstimulant drug approved for the treatment of ADHD, and in Europe is at present the only medication approved to be used in adult patients with ADHD. More recently, following the results of pivotal, randomized, double-blind, placebo-controlled studies24–26 showing the efficacy and good tolerability profile of guanfacine in its extended-release formulation (GXR) in youth diagnosed of ADHD, this α2-adrenergic receptor agonist has been approved (Intuniv®; Shire PLC, Wayne, Dublin, Ireland) in several countries for the treatment of ADHD as monotherapy and as adjunctive therapy to stimulant medications in children and adolescents (6–17 years of age). Although some recent reports,22,27 including a systematic review and meta-analysis,28 have reviewed the usefulness of GXR in the treatment of ADHD, additional evidence has been published on the efficacy, tolerability, and cost-effectiveness of this α2-adrenergic receptor agonist as a pharmacotherapy for ADHD. Therefore, the present paper aims to provide a comprehensive, critical, and updated review on the pharmacodynamic and pharmacokinetic characteristics and published evidence on the efficacy, cost-effectiveness, and safety and tolerability profile of GXR in the treatment – as monotherapy or as an add-on medication – of children and adolescents with ADHD. A comprehensive search of relevant databases (PubMed, Embase, and PsycInfo) was conducted to identify potentially relevant studies published in English in peer-reviewed journals until January 15, 2015, using the following search terms: (“guanfacine” or “guanfacine extended-release”) and (“child” or “adolescent” or “pediatrics”) and (“ADHD” or “attention deficit disorder” or “attention hyperactivity disorder” or “hyperactivity” or “hyperkinetic disorder”). The literature search included clinical studies with children or adolescents aged 6–17 years as participants. There were no restrictions on the identification or inclusion of studies in terms of publication status, type of publication, or design type. However, abstracts of presentations to specialist meetings and conferences were not included. Titles and abstracts were screened for inclusion/exclusion and appropriateness, and full-text versions were retrieved. Guanfacine is cleared both by the liver and the kidney. GXR has a long elimination half-life: 14.4 hours in children and 17.9 hours adolescents after a single 2 mg dose.40 Guanfacine is metabolized by oxidation to form 3-hydroxy-guanfacine, its main metabolite.42 As evidenced in an in vitro study assessing P-glycoprotein substrate properties, it appears that the role of P-glycoprotein in guanfacine transport is at best minor and unlikely to be of clinical relevance in interindividual variability in response to guanfacine therapy.44 The cytochrome P450 (CYP)-3A4 isoenzyme is the primary enzyme involved in the oxidative metabolism of guanfacine.33 However, while it does not appear to be an inhibitor of the major CYP isoenzymes, guanfacine is a substrate of CYP3A4/5.33 Concomitant administration with drugs that inhibit CYP3A4/5 activity significantly increased plasma concentrations of guanfacine, potentially increasing the incidence and severity of AEs.22,45 Likewise, administration of guanfacine and another medication that induces the CYP3A4 system, like rifampicin, may decrease the Cmax of guanfacine by more than 50%.45 In addition, when guanfacine and valproic acid are administered simultaneously, plasma valproate levels may rise significantly.46 However, two small open-label studies conducted with healthy adults revealed that coadministration of GXR and MPH47 or lisdexamfetamine48 did not result in significant pharmacokinetic drug–drug interactions. A systematic review and meta-analysis of published and unpublished studies indicated that compared with placebo, guanfacine was safe and effective in treating children and adolescents with ADHD.28 This meta-analysis, which included 1,752 patients of pediatric age from seven RCTs with durations of 6–16 weeks, revealed that overall, 694 of 1,177 (59.0%) children or adolescents in the guanfacine group benefited from the treatment compared to 192 of 575 (33.3%) in the placebo group (pooled odds ratio [OR] 3.2). 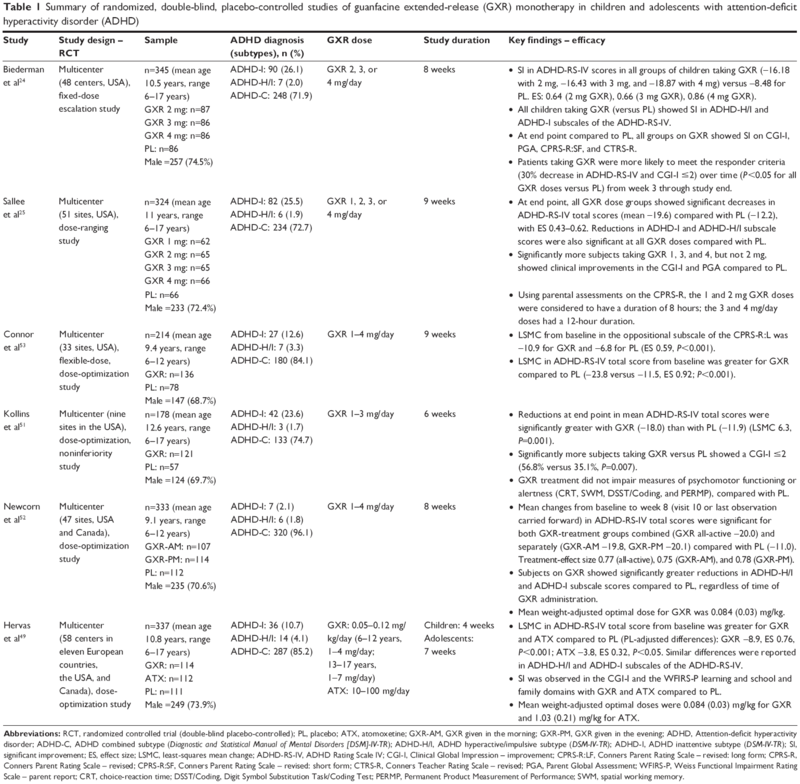 As summarized in Table 1, several multicenter studies have assessed the efficacy of GXR in the treatment of children and adolescents with ADHD as monotherapy in short-term RCTs24,25,49,51–53 and long-term extension studies,54,55 as well as adjunctive pharmacotherapy in combination with stimulants for those patients who failed to have an adequate response with the latter medication.26,50 All the different studies but one relied on changes on changes from baseline in the Attention-Deficit/Hyperactivity Disorder Rating Scale IV (ADHD-RS-IV) as the primary outcome measure, with one exception53 that used the ADHD-RS-IV as secondary outcome measure. Other secondary measures in the different reports included the Before-School Functioning Questionnaire, Conners Global Index – Parent, Conners Parent Rating Scale – revised: short form (CPRS-R:SF), CPRS-R: long form (CPRS-R:LF), Conners Teacher Rating Scale – revised, Clinical Global Impression – improvement (CGI-I), CGI – severity, Parent Global Assessment (PGA), and Child Health Questionnaire – parent form. Abbreviations: RCT, randomized controlled trial (double-blind placebo-controlled); PL, placebo; ATX, atomoxetine; GXR-AM, GXR given in the morning; GXR-PM, GXR given in the evening; ADHD, Attention-deficit hyperactivity disorder; ADHD-C, ADHD combined subtype (Diagnostic and Statistical Manual of Mental Disorders [DSM]-IV-TR); ADHD-H/I, ADHD hyperactive/impulsive subtype (DSM-IV-TR); ADHD-I, ADHD inattentive subtype (DSM-IV-TR); SI, significant improvement; ES, effect size; LSMC, least-squares mean change; ADHD-RS-IV, ADHD Rating Scale IV; CGI-I, Clinical Global Impression – improvement; CPRS-R:LF, Conners Parent Rating Scale – revised: long form; CPRS-R, Conners Parent Rating Scale – revised; CPRS-R:SF, Conners Parent Rating Scale – revised: short form; CTRS-R, Conners Teacher Rating Scale – revised; PGA, Parent Global Assessment; WFIRS-P, Weiss Functional Impairment Rating Scale – parent report; CRT, choice-reaction time; DSST/Coding, Digit Symbol Substitution Task/Coding Test; PERMP, Permanent Product Measurement of Performance; SWM, spatial working memory. The efficacy of GXR monotherapy was initially assessed in two similarly designed, pivotal placebo-controlled RCTs in children and adolescents with ADHD (Table 1).24,25 In these two short-term trials, patients were assigned to receive either GXR 2, 3, or 4 mg (n=345),24 GXR 1, 2, 3, or 4 mg (n=324),25 or placebo. In either study, all treatment groups showed significant improvements in ADHD core symptoms, as indicated by significant reductions in ADHD-RS-IV scores at end point compared to placebo, starting 1–2 weeks after they began receiving once-daily GXR, with effect sizes (ESs) ranging from 0.43 to 0.86.24,25 Post hoc subgroup analyses revealed that while children 6–12 years of age taking any of the GXR doses in either study exhibited significant improvement compared to placebo, this was not the case for adolescents (aged 13–17 years). Although the small sample size of this cohort in both studies – 23.2% (n=80)24 and 25% (n=80)25 of the total sample – did not allow the drawing of clear conclusions, this finding may support the need, as mentioned earlier, of using weight-adjusted doses.33,40 In addition, both studies24,25 reported significantly greater mean improvements at end point with GXR compared with placebo on both the inattention and hyperactivity/impulsivity subscales of the ADHD-RS-IV, and on secondary outcome measures, including the CGI-I, the PGA, the CPRS-R:SF and the Conners Teacher Rating Scale – revised. An additional 9-week RCT explored the effects of GXR (1–3 mg/day, mean weight-adjusted optimal dose 0.052 mg/kg/day) on psychomotor functioning, alertness, and daytime sleepiness in 182 children and adolescents with ADHD using a laboratory-classroom setting (Table 1).51 GXR was associated with a significant mean reduction in ADHD-RS-IV at end point, and significantly more patients receiving GXR were rated as improved (56.8%) compared to placebo (35.1%). However, there were no significant differences between GXR and placebo on measures of psychomotor functioning, alertness, or other cognitive tasks; likewise, GXR was not associated with increased daytime sleepiness, thus suggesting that the beneficial effects of GXR on ADHD symptoms were independent of sedation-related effects. The efficacy and tolerability of GXR (up to 4 mg/day) administered in the morning (GXR-AM; mean dose 2.9 mg/day) or in the evening (GXR-PM; mean 3 mg/day) compared to placebo was assessed in another 8-week multicenter RCT with 333 children 6–12 years of age with ADHD (Table 1).52 GXR-AM or -PM was associated with significant and clinically meaningful improvements in ADHD symptoms, as evidenced by reductions in ADHD-RS-IV scores compared to placebo, with ESs of 0.75 for GXR-AM and 0.78 for GXR-PM, and onset of efficacy starting at first postbaseline visit.52 A post hoc analysis of the data from this dose-optimization study assessed the consistency of the effects on oppositional and ADHD symptoms throughout the day of once-daily GXR-AM or -PM monotherapy using the CPRS–R:SF.56 At end point, children taking GXR showed significantly greater improvement from baseline in mean CPRS-R:SF total score, and in each of the morning, afternoon, and evening CPRS-R:SF assessments compared with placebo, regardless of the time of GXR administration (P<0.001). In addition, GXR was associated with significantly greater improvements from baseline in each CPRS-R:SF subscale score (oppositional, cognitive problems/inattention, hyperactivity, and ADHD index) compared to placebo, regardless of time of administration, with ESs within each subscale across the different times of GXR administration ranging from 0.55 to 0.85 for GXR-AM and from 0.47 to 0.68 for GXR-PM. More recently, Hervas et al49 assessed the efficacy and safety of once-daily dose-optimized GXR (0.05–0.12 mg/kg/day: 6–12 years, 1–4 mg/day; 13–17 years, 1–7 mg/day) compared with placebo and ATX (10–100 mg/day) in the treatment of children and adolescents with ADHD. GXR and ATX were significantly more effective than placebo in improving core symptoms, as assessed by changes from baseline in ADHD-RS-IV total score (GXR −23.9, versus ATX −18.8, versus placebo −15.0); in addition, there was a significantly greater reduction in ADHD-RS-IV total score in GXR compared with ATX (−5.1, ES 0.440; P=0.001). At end point, significantly more patients taking GXR and ATX compared to placebo showed an improvement in CGI-I (67.9%, 56.3%, and 44.1% for GXR, ATX, and placebo, respectively). Statistically significant differences were seen for other key secondary variable measures, including Weiss Functional Impairment Rating Scale – parent-report learning, school, and family domains in the GXR group compared with placebo. Onset of efficacy was seen at visit 3 (week 1) for GXR and at visit 5 (week 3) for ATX. Another placebo-controlled RCT explored the effects of GXR monotherapy (1–4 mg daily, mean 2.87 mg/day) on oppositional symptoms in children aged 6–12 years with a diagnosis of ADHD (Table 1).53 Change scores at end point in the oppositional subscale of the CPRS-R:LF from baseline was the primary efficacy measure of this 9-week dose-optimization study. Compared with placebo, treatment with GXR was associated with significantly greater improvements in CPRS-R:LF oppositional subscale scores, with an ES of 0.59. Furthermore, GXR significantly reduced core symptoms of ADHD, as assessed by the clinician-rated ADHD-RS-IV total score, with an ES of 0.92. A post hoc correlation analysis between percentage reduction from baseline to end point in CPRS-R:LF oppositional subscale and ADHD-RS-IV total scores revealed a positive correlation between reductions in oppositional symptoms and ADHD core symptoms (r=0.74). GXR has also been shown to be efficacious as adjunctive therapy to psychostimulant medications, as shown in an open-label safety study50 and a large double-blind RCT.26 A multicenter, open-label, 9-week dose-escalation study examined the safety and effectiveness of GXR (1, 2, 3, or 4 mg/day; mean 3.1 mg/day, 0.07 mg/kg/day) administered concomitantly with MPH or AMP in 75 children and adolescents aged 6–17 years (mean age 11.6 years) with ADHD who had suboptimal control of ADHD symptoms with psychostimulants alone.50 Coadministration of GXR and MPH or AMP was generally safe and associated with statistically and clinically significant ADHD-symptom improvement. Indeed, a significant reduction from baseline (psychostimulant alone) in ADHD-RS-IV total score was observed with combination therapy (stimulants + GXR −16.1 [56%], P<0.0001; MET + GXR −17.8, AMP + GXR −13.8); similar significant reductions were observed in mean scores of both the inattentiveness (P<0.0001) and hyperactivity/impulsivity (P<0.0001) subscales of the ADHD-RS-IV. In addition, 73% and 84.1% of children and adolescents in the study showed an improvement in CGI-I and PGA scores, respectively. Note: Data from the multicenter RCT conducted by Kollins et al51 were not included in this table, because only the three most common TEAEs were included in their report. Abbreviations: GXR, guanfacine extended-release; PL, placebo; ATX, atomoxetine; NR, not reported; RCT, randomized controlled trial. The incidence and severity of TEAEs with adjunctive administration of GXR to a psychostimulant26,50 was overall similar to that observed in the clinical studies of GXR alone. Moreover, no unique TEAE emerged from GXR adjunctive to a long-acting psychostimulant.26,50 This is consistent with findings from studies conducted in healthy adults showing that no unique TEAEs were observed with coadministration of GXR and MPH47 or lisdexamfetamine48 compared with either treatment alone. As evidenced in short-term RCTs and in long-term open-label extension studies, GXR administered once daily either in the morning or evening has been shown to be effective as monotherapy in children and adolescents with ADHD.24,25,28,49,51–55 Furthermore, GXR has also been associated with significant and clinically meaningful improvements in ADHD symptoms as adjunctive therapy to MPH- or AMP-based medications in patients with suboptimal responses to stimulants.26,50 Indeed, the treatment ESs across the different studies are comparable with that observed with other medications used for treating children and adolescents with ADHD.23,71 Moreover, GXR may show greater symptom reduction than ATX.49,57 The effectiveness of GXR on oppositional symptoms in children with ADHD53,56,57 could be of particular interest, based on the high rates of comorbid ODD and ADHD,8 but also considering that atypical antipsychotics are widely used, generally in combination, for patients with ODD or other severe comorbidities.72 In contrast, the different studies demonstrated a positive risk–benefit profile of GXR in the treatment of children and adolescents with ADHD.24–26,28,49–51,53–55 While the incidence of sedation-related AEs is more frequent than with ATX or stimulants,51 these appear to be unrelated to the therapeutic effects of GXR, and the overall pattern and incidence of TEAEs are consistent with that seen with other medications approved for ADHD.73 Although BP and HR should be monitored prior to initiation of therapy and periodically during guanfacine treatment, ECG monitoring is unnecessary unless there is a personal or family history of cardiac disease, arrhythmias, or sudden unexpected death.68,69 Overall, the reviewed evidence suggests that GXR will be a useful and safe nonstimulant treatment option for the broad-spectrum management of ADHD symptoms. JM-R has received honoraria for being a speaker and on advisory boards from Shire and Janssen Pharmaceuticals. CK and RdA report no conflicts of interest in this work. No sources of funding were used in the preparation, review, or approval of this manuscript. American Psychiatric Association. Diagnostic and Statistical Manual of Mental Disorders. 5th ed. Arlington (VA): American Psychiatric Publishing; 2013. Feldman HM, Reiff MI. Clinical practice. Attention deficit-hyperactivity disorder in children and adolescents. N Engl J Med. 2014;370(9):838–846. Polanczyk GV, Willcutt EG, Salum GA, Kieling C, Rohde LA. ADHD prevalence estimates across three decades: an updated systematic review and meta-regression analysis. Int J Epidemiol. 2014;43(2):434–442. Gau SS, Ni HC, Shang CY, et al. Psychiatric comorbidity among children and adolescents with and without persistent attention-deficit hyperactivity disorder. Aust N Z J Psychiatry. 2010;44(2):135–143. Kooij JJ, Huss M, Asherson P, et al. Distinguishing comorbidity and successful management of adult ADHD. J Atten Disord. 2012;16(5 Suppl):3S–19S. Martinez-Raga J, Szerman N, Knecht C, de Alvaro R. Attention deficit hyperactivity disorder and dual disorders. Educational needs for an underdiagnosed condition. Int J Adolesc Med Health. 2013;25(3):231–243. Connor DF, Doerfler LA. ADHD with comorbid oppositional defiant disorder or conduct disorder: discrete or non-distinct disruptive behavior disorders? J Atten Disord. 2008;12(2):126–134. National Collaborating Centre for Mental Health. Attention Deficit Hyperactivity Disorder: The NICE Guideline on Diagnosis and Management of ADHD in Children, Young People and Adults. London: Alden Press; 2009. Akutagava-Martins GC, Salatino-Oliveira A, Kieling CC, Rohde LA, Hutz MH. Genetics of attention-deficit/hyperactivity disorder: current findings and future directions. Expert Rev Neurother. 2013;13(4):435–445. Freitag CM, Rohde LA, Lempp T, Romanos M. Phenotypic and measurement influences on heritability estimates in childhood ADHD. Eur Child Adolesc Psychiatry. 2010;19(3):311–323. Cortese S, Kelly C, Chabernaud C, et al. Toward systems neuroscience of ADHD: a meta-analysis of 55 fMRI studies. Am J Psychiatry. 2012;169(10):1038–1055. Arnsten AF. The emerging neurobiology of attention deficit hyperactivity disorder: the key role of the prefrontal association cortex. J Pediatr. 2009;154(5):I–S43. Bradley C. The behavior of children receiving Benzedrine. Am J Psychiatry. 1937;94(3):577–585. Canadian Attention Deficit Hyperactivity Disorder Resource Alliance (CADDRA). Canadian ADHD Practice Guidelines. 3rd ed. Toronto: CADDRA; 2011. Subcommittee on Attention-Deficit Hyperactivity. ADHD: clinical practice guideline for the diagnosis, evaluation, and treatment of attention-deficit/hyperactivity disorder in children and adolescents. Pediatrics. 2011;128(5):1007–1022. Biederman J, Faraone SV. Attention-deficit hyperactivity disorder. Lancet. 2005;366(9481):237–248. Peterson K, McDonagh MS, Fu R. Comparative benefits and harms of competing medications for adults with attention-deficit hyperactivity disorder: a systematic review and indirect comparison meta-analysis. Psychopharmacology (Berl). 2008;197(1):1–11. Cortese S, Holtmann M, Banaschewski T, et al. Practitioner review: current best practice in the management of adverse events during treatment with ADHD medications in children and adolescents. J Child Psychol Psychiatry. 2013;54(3):227–246. Faraone SV, McBurnett K, Sallee FR, Steeber J, López FA. Guanfacine extended release: a novel treatment for attention-deficit/hyperactivity disorder in children and adolescents. Clin Ther. 2013;35(11):1778–1793. Savill NC, Buitelaar JK, Anand E, et al. The efficacy of atomoxetine for the treatment of children and adolescents with attention-deficit/hyperactivity disorder: a comprehensive review of over a decade of clinical research. CNS Drugs. 2015;29(2):131–151. Biederman J, Melmed RD, Patel A, et al. A randomized, double-blind, placebo-controlled study of guanfacine extended release in children and adolescents with attention-deficit/hyperactivity disorder. Pediatrics. 2008;121(1):e73–e84. Wilens TE, Bukstein O, Brams M, et al. A controlled trial of extended-release guanfacine and psychostimulants for attention-deficit/hyperactivity disorder. J Am Acad Child Adolesc Psychiatry. 2012;51(1):74–85. Elbe D, Reddy D. Focus on guanfacine extended-release: a review of its use in child and adolescent psychiatry. J Can Acad Child Adolesc Psychiatry. 2014;23(1):48–60. Cohen DJ, Young JG, Nathanson JA, Shaywitz BA. Clonidine in Tourette’s syndrome. Lancet. 1979;2(8142):551–553. Gourlay S, Forbes A, Marriner T, Kutin J, McNeil J. A placebo-controlled study of three clonidine doses for smoking cessation. Clin Pharmacol Ther. 1994;55(1):64–69. Gowing LR, Farrell M, Ali RL, White JM. Alpha2-adrenergic agonists for the management of opioid withdrawal. Cochrane Database Syst Rev. 2014;3:CD002024. Sallee F, Connor DF, Newcorn JH. A review of the rationale and clinical utilization of α2-adrenoceptor agonists for the treatment of attention-deficit/hyperactivity and related disorders. J Child Adolesc Psychopharmacol. 2013;23(5):308–319. Intuniv (guanfacine extended-release tablets) [US prescribing information]. Wayne (PA): Shire Pharmaceuticals Inc; 2014. Bidwell LC, Dew RE, Kollins SH. Alpha-2 adrenergic receptors and attention-deficit/hyperactivity disorder. Curr Psychiatry Rep. 2010;12(5):366–373. Scahill L. Alpha-2 adrenergic agonists in children with inattention, hyperactivity and impulsiveness. CNS Drugs. 2009;23 Suppl 1:43–49. Arnsten AF, Scahill L, Findling RL. Alpha2-adrenergic receptor agonists for the treatment of attention-deficit/hyperactivity disorder: emerging concepts from new data. J Child Adolesc Psychopharmacol. 2007;17(4):393–406. Connor DF, Rubin J. Guanfacine extended release in the treatment of attention deficit hyperactivity disorder in children and adolescents. Drugs Today (Barc). 2010;46(5):299–314. Boellner SW, Pennick M, Fiske K, Lyne A, Shojaei A. Pharmacokinetics of a guanfacine extended-release formulation in children and adolescents with attention-deficit-hyperactivity disorder. Pharmacotherapy. 2007;27(9):1253–1262. Bukstein OG, Head J. Guanfacine ER for the treatment of adolescent attention-deficit/hyperactivity disorder. Expert Opin Pharmacother. 2012;13(15):2207–2213. Kiechel J. Pharmacokinetics and metabolism of guanfacine in man: a review. Br J Clin Pharmacol. 1980;10 Suppl 1:25S–32S. Swearingen D, Pennick M, Shojaei A, Lyne A, Fiske K. A phase I, randomized, open-label, crossover study of the single-dose pharmacokinetic properties of guanfacine extended-release 1-, 2-, and 4-mg tablets in healthy adults. Clin Ther. 2007;29(4):617–625. Gillis NK, Zhu HJ, Markowitz JS. An in vitro evaluation of guanfacine as a substrate for P-glycoprotein. Neuropsychiatr Dis Treat. 2010;7(1):501–505. Muir VJ, Perry CM. Guanfacine extended-release: in attention deficit hyperactivity disorder. Drugs. 2010;70(13):1693–1702. Ambrosini PJ, Sheikh M. Increased plasma valproate concentrations when coadministered with guanfacine. J Child Adolesc Psychopharmacol. 1998;8(2):143–147. Roesch B, Corcoran M, Haffey M, et al. Pharmacokinetics of coadministration of guanfacine extended release and methylphenidate extended release. Drugs R D. 2013;13(1):53–61. Roesch B, Corcoran ME, Fetterolf J, et al. Pharmacokinetics of coadministered guanfacine extended release and lisdexamfetamine dimesylate. Drugs R D. 2013;13(2):119–128. Spencer TJ, Greenbaum M, Ginsberg LD, Murphy WR. Safety and effectiveness of coadministration of guanfacine extended release and psychostimulants in children and adolescents with attention-deficit/hyperactivity disorder. J Child Adolesc Psychopharmacol. 2009;19(5):501–510. Biederman J, Melmed RD, Patel A, McBurnett K, Donahue J, Lyne A. Long-term, open-label extension study of guanfacine extended release in children and adolescents with ADHD. CNS Spectr. 2008;13(12):1047–1055. Sallee FR, Lyne A, Wigal T, Mcgough JJ. Long-term safety and efficacy of guanfacine extended release in children and adolescents with attention-deficit/hyperactivity disorder. J Child Adolesc Psychopharmacol. 2009;19(3):215–226. Signorovitch J, Erder MH, Xie J, et al. Comparative effectiveness research using matching-adjusted indirect comparison: an application to treatment with guanfacine extended release or atomoxetine in children with attention-deficit/hyperactivity disorder and comorbid oppositional defiant disorder. Pharmacoepidemiol Drug Saf. 2012;21 Suppl 2:130–137. Kaplan S, Heiligenstein J, West S, et al. Efficacy and safety of atomoxetine in childhood attention-deficit/hyperactivity disorder with comorbid oppositional defiant disorder. J Atten Disord. 2004;8(2):45–52. Cutler AJ, Brams M, Bukstein O, et al. Response/remission with guanfacine extended-release and psychostimulants in children and adolescents with attention-deficit/hyperactivity disorder. J Am Acad Child Adolesc Psychiatry. 2014;53(10):1092–1101. Wilens TE, McBurnett K, Turnbow J, Rugino T, White C, Youcha S. Morning and evening effects of guanfacine extended release adjunctive to psychostimulants in pediatric ADHD: results from a phase III multicenter trial. J Atten Disord. Epub 2013 Sep 26. Findling RL, McBurnett K, White C, Youcha S. Guanfacine extended release adjunctive to a psychostimulant in the treatment of comorbid oppositional symptoms in children and adolescents with attention-deficit/hyperactivity disorder. J Child Adolesc Psychopharmacol. 2014;24(5):245–252. Doshi JA, Hodgkins P, Kahle J, et al. Economic impact of childhood and adult attention-deficit/hyperactivity disorder in the United States. J Am Acad Child Adolesc Psychiatry. 2012;51(10):990–1002. Wittchen HU, Jacobi F, Rehm J, et al. The size and burden of mental disorders and other disorders of the brain in Europe 2010. Eur Neuropsychopharmacol. 2011;21(9):655–679. Wu EQ, Hodgkins P, Ben-Hamadi R, et al. Cost effectiveness of pharmacotherapies for attention-deficit hyperactivity disorder: a systematic literature review. CNS Drugs. 2012;26(7):581–600. Erder MH, Xie J, Signorovitch JE, et al. Cost effectiveness of guanfacine extended-release versus atomoxetine for the treatment of attention-deficit/hyperactivity disorder application of a matching-adjusted indirect comparison. Appl Health Econ Health Policy. 2013;10(6):381–395. Sikirica V, Findling RL, Signorovitch J, et al. Comparative efficacy of guanfacine extended release versus atomoxetine for the treatment of attention-deficit/hyperactivity disorder in children and adolescents: applying matching-adjusted indirect comparison methodology. CNS Drugs. 2013;27(11):943–953. Sikirica V, Erder MH, Xie J, et al. Cost effectiveness of guanfacine extended release as an adjunctive therapy to a stimulant compared with stimulant monotherapy for the treatment of attention-deficit hyperactivity disorder in children and adolescents. Pharmacoeconomics. 2012;30(8):e1–e15. Vitiello B, Towbin K. Stimulant treatment of ADHD and risk of sudden death in children. Am J Psychiatry. 2009;166(9):955–957. Martinez-Raga J, Knecht C, Szerman N, Martinez MI. Risk of serious cardiovascular problems with medications for attention-deficit hyperactivity disorder. CNS Drugs. 2013;27(1):15–30. Martin P, Satin L, Kahn RS, et al. A thorough QT study of guanfacine. Int J Clin Pharmacol Ther. 2015;53(4):301–316. Faraone SV, Buitelaar J. Comparing the efficacy of stimulants for ADHD in children and adolescents using meta-analysis. Eur Child Adolesc Psychiatry. 2010;19(4):353–364. Weiss M, Panagiotopoulos C, Giles L, et al. A naturalistic study of predictors and risks of atypical antipsychotic use in an attention-deficit/hyperactivity disorder clinic. J Child Adolesc Psychopharmacol. 2009;19(5):575–582. Graham J, Coghill D. Adverse effects of pharmacotherapies for attention-deficit hyperactivity disorder. Epidemiology, prevention and management. CNS Drugs. 2008;22(3):213–237.